The 6 GOLDEN Heavy Body Acrylics in this set can provide the foundation for the professional acrylic painter working with heavy body viscosity paint. 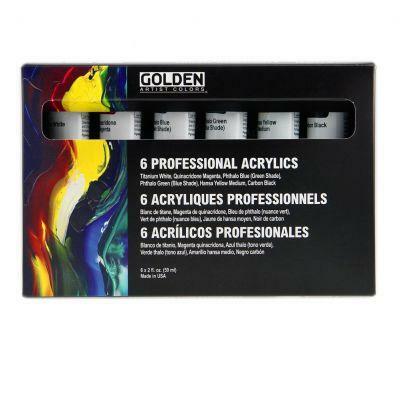 The GOLDEN Principal Heavy Body set is a more cost effective way to establish a basic palette, capable of mixing a full range of hues, tints, and shades, that can later be supplemented with the wide selection of GOLDEN Heavy Body colour offerings. The larger tube size gives an ample supply of paint for exploring many mixing and application possibilities.